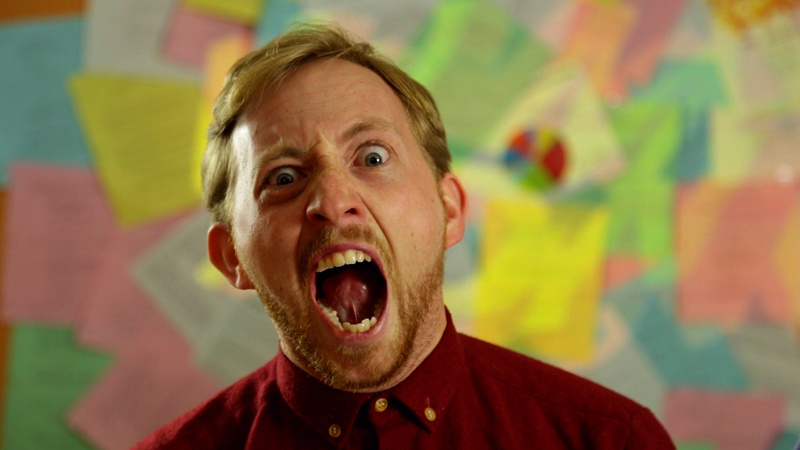 A story-driven sketch series that depicts everyday life in a deranged and eccentric town. Why should you, the media, or an anthropomorphic rock give two hoots about HumanTown? After we HYPE IT up in this latest video, you'll know why! Be sure to watch the last 3 frames! You assume right. That IS how I talk these days! Hope I can keep talking come Monday. You guys really deserve a top 15 spot. Why? Well, partly hard work, talent, expertise, and top notch production, but mostly, because you are all so cute and funny! Love ya. HumanTown and the hilarious Heir Heads team are doing a joint promotional event at the Little Mountain Gallery on Main St. Vancouver! Come on Sat Nov 8th at 9pm for some unreleased video content, a live Q & A session and some lightning hot Improv! Kane laughs at a joke told by our boom operator. Ki does some standard physical warm-ups before a tough, emotional take. Dan relaxes before our make-up team applies the 3 hours of prosthetics required to make him appear normal on camera. Kane, Ki and Daniel relax between takes. 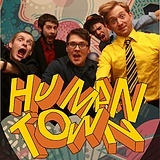 While Kane, Ki, and Daniel have their names on the HumanTown page, the HumanTown team is a sextuplet. Emphasis on "TUP". I hereby state that the following commentary is over the required 100 characters and is as follows: love it! You guys are incredible. Just binged on all your shows. Bravo. You guys have one of the best Ideas I have seen in this competition! Congratulations on making it this far! if my friends don't win this thing. I'm pulling for you guys for sure! Good hype-it video. Defintely not as strong as some of the other videos your team did but it still explains the show effectively. I'm sure i'll be seeing you in the top 15. Love the pictures! You guys seem like you have a ton of fun together! Congrats on making the top 55, and good luck in the rest of the competition. I'm sure we'll be seeing you in the top 15! While I can't get behind the title, the whole concept is something I've always thought would/could be a fantastic approach to sketch comedy on television, and I'm glad to see that it's being executed so skillfully here and by such a talented and wonderful group of people. There's an obvious camaraderie on display here in a video that touches on so many elements of what makes your team special, while never ceasing to be engaging and relatable. Awesome work, can't wait to see more. Haha, totally agreed. Has a lot of potential! Congrats on making the top 55 and good luck in the rest of the voting. Wishing you the best in the competition, your good friend Sharon. *Great senses of humor and great writing skills! Good friends. Plenty of grimacing face. Friendly friendly. Not a lot of fresh milk here for the whole family. Love you love, though. Congratulations on making it to the Top 55! Creative team, interesting concept. It’s tough to come up with solid product each week so kudos for your hard work. Best of luck moving into the top 15. Hey guys .....way to go on your concept and congratulations on making the top fifty five! It's clear you are having fun and getting the job done! Good luck tomorrow night and the top fifteen! Keep it up! I can't remember if I've already posted to this week, but I love how you guys mix sketch comedy into your talking heads videos. Though, I do wish for more straight up videos without the talking heads, but I'm sure there will be. The sell sheet has a good idea for visuals, but it looks a bit off. This show really is a crazy concept. Like its kind of bonkers when you think about it. I guess that's why myself and so many others like it. I look forward to seeing what you guys pull out next week. Great loved it from start to finish, everything was exceptional about this. I love videos, I love comedy and I love this sooooo much. All the best and best of luck in this glorious competition!!!!!! Very well done guys. No awkwardness in here at all. Are you really all 6 friends who've been working on film for that long? That's not an easy thing to do! I wonder how much of what you do is for your productions versus hanging out... they likely go hand in hand I guess... PS I like the way this was shot. Keep going!! You're on to something!! Good job, way to go and get er done! Consider me hyped. High energy and good looking dudes = oh yeah! I really like the tone of this group. Kooky, but not annoyingly kooky. Serious, but not annoyingly serious. And some solid deadpan humour. Nicely done. Its clear you guys have been working together for awhile - its always great to see projects that have evolved over time. Strong work. Keep at it! Hopefully see you in the top 15! Dumb idea and horrible acting. I can't believe anyone would watch this show... Just kidding, great work! Definitely one of the top videos. 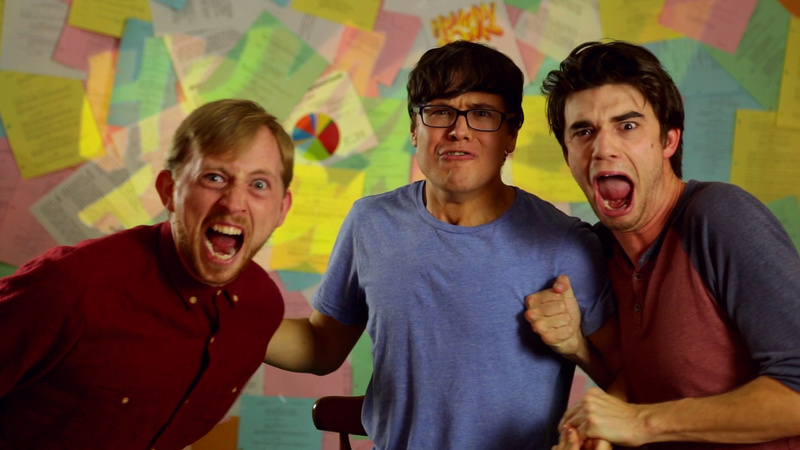 A great idea a sketch show. A canadian tradition. Great way to promote yourselves. Great job! I hope you guys do well!! Great work guys! Great info and jam pack with laughs. I'm a Hugh fan of this humour and this is really original. Wow, an awful lot going on in this clip! It's a little too fast paced and zany for my taste but possibly just because of the amount of info packed into a short time frame(?) It's not a show I would tune into but I do wish you all the best in the future. It's always great when you can keep a team of friends together having fun & doing what they love! Front runners for sure. Been following this team from the start and I haven't been disappointed yet. I'd wish you guys luck getting into the top 15 but y'all don't need it. Good Job Guys keep it up and you'll be top 15 for sure!!!! Really funny stuff! Can't wait to see more! Great job guys, as usual. Love the humor and the editing in all your videos. The concept is strong and would be great for television. Hope to see you in the top 15! Who gives two cats and half a dog? LOVE THAT LINE. I like what you guys are doing! It's funny, well-put-together, and y'all are charming. I'd love to see you guys at some live comedy shows in the city! Where ARE you? Some good projects on this list. I'd consider checking out Littleton Falls as well. Those guys are definitely for real. 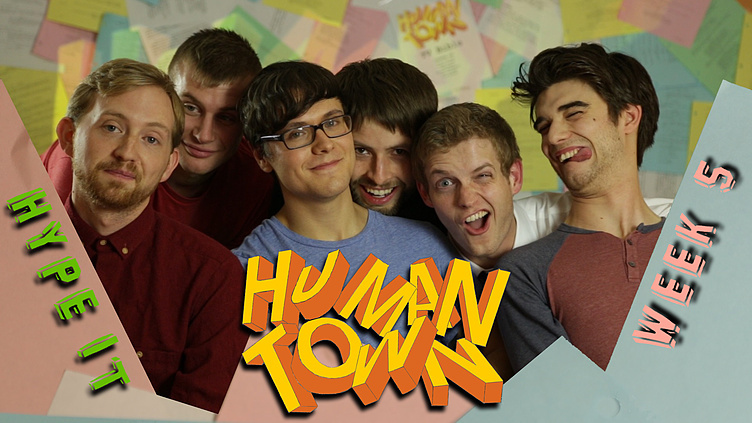 Human Town has been one of my favorite projects from the beginning. Incredibly great production value on the videos and a solid team behind it. Good luck with the Top15 voting! There is lots of information in this week's video. Good job. I like the accelerator sound effects. The story line doesn't really interest me but good luck to a good group of friends. Tons of info packed into this hype it. Great visuals. My favourite video is Save Liam because it has Liam in it. Also love the Message from the Future. Hope you win! You guys have a great idea! I really hope this show goes somewhere, I can see it having a good following because it's such an original concept, and you guys are really funny. Good luck! Great effects and I got a feel for your team. Hard to get super excited about a sketch show but it seems like it has an angle and your team seems great. Best of luck. The makeup and effects on this are fantastic. I'm looking forward to seeing more of this in the future. The week six project should be interesting to see. I like the concept and the possibilities that Human Town is bringing to the competition. Not sure all the previous cred makes me want to really get behind them though. The quality of the writing and video should tell us all we need to know. The teaser got me from the content that had been shot prior to this competition. That showed me a good concept and the ability to make it work. I hadn't seen anything about Human Town before your week five video, your use of imagery across the screen documenting your progress and achievement so far was an excellent way of circumventing the minute and a half time limit to hype your show AND keep the comedy. Best of luck! That Kane is just such a riot. The likability of the trio in this video is really what sold me, but I'd like to see more of your actual comedy. I agree with Renee below. The self-congratulatory tone verges on being off putting in this hype video even though you guys are clearly funny. I would have liked to have seen a more creative and subtle approach to your self-promotion. I still look forward to more videos! Good luck! congratulations on making it to the top 55! Oh i like it- great concept- yeah I'd watch this one for sure. Good luck in earning yourself a spot in the top 15! Good job on the video fella's, The goblin costume was great! Who ever made that deserves some recognition for sure. Looks like you guys have been playing around with this idea for quite some time. Good luck with the push to the top 15 and look forward to meet you guys at the event on Saturday! Good video guys, I hope to see some more of your sketches and work. I like the whole tied together plot idea. Can't wait to meet you guys at the hype it event!! I think your concept is unique enough, and I loved hearing more about your guys in this week's video. But I don't think you really gave us an "angle" in which to view your project. Should we care just because you've won stuff before? Tell us something more. It sounds weird to say, but even comic characters have to be taken seriously by viewers, and I just can't do it. The video thumbnail just reminds me of any bunch of party dudes taking a selfie for Facebook in a smoky apartment. Just needs a dash of bloodshot in the eyes and a couple of bird flips. Congratulations on finishing the video for this week and good luck in all your missions in the future. It seems like it would be a good show. Good job guys, very informative. I hope you guys make it into the top 15, you are one of my favorites for sure. The concept is really clever and nerd culture is reaching a peak in the mainstream, so there's relevance. Anything that give nerds more cred than big bang theory is a thumbs up in my books. Overwhelmingly, my favorite group out of all of them. You guys have the most consistent quality, variety and confidence in your weekly videos. I feel like you're actually ready to make a show. You guys seem really passionate at what you do and your ideas and I respect that. However, I don't think your concept is for me. I think it is a little too all over the map sounding for me to get into it. Best of luck tho. It was nice to have a chance to see the humans behind "HumanTown," to give some context to all the wacky videos you've shared so far. I think that you have created a really solid product - and hope that you're able to take it where you want to. Good luck! interesting concept, I could see it having a cult following. Don't know if I would watch it myself, but I can appreciate good work. you guys are obviously committed to going the distance so good luck to you! I absolutely adore this group! The originality of dark humor and non-connecting sketches are all very exciting to me! The boys here are my main runners, I hope they make it to the top 15 because thats who I'm willing to watch on Tv! You guys seem like a great group and have a great sense of humour. I'm not sure if TV is quite ready for you yet. Mainly because I'm not even too sure what you are all about. Whatever it is, it is definitely interesting that's for sure. Not sure what a sketch comedy is , which wasn't really explained in this video. Some of the concepts are dark humour, ? Prime time television? Good luck in the voting round! Interesting idea to take a sketch comedy and continue it episode to episode. Does this mean your characters would also evolve? That could be engaging. I'm new to your work - just wondering if you have any strong female characters? anthropomorphic is a super big word guys! but i like it! really fun movie this week everyone. good luck on the top 15 and congratulations on the top fifty five!!! I like the idea of each sketch continuing into the next somehow. I'm a little concerned it may become a little gimmicky but if done right, it should be super fun to watch. Good luck! I am really digging your concept of the show. Would like to see more, there is something about it that just makes me want to watch more and more of it. I love this group, and you guys are awesome. I definitely want to see this show get made. In fact, it's an act of Satan himself that it hasn't been made. Everyone one of your submissions are totally awesome, and you guys seem to have some kind of debilitating genetic disease where you can't stop being funny. If I wasn't already going to spend all of my votes on my own project, I would totally spend them all on yours. Lets brolaborate somehow in the future (in addition to the joint event we're already brolaborating on). I am a big fan of skit shows. My favorite right now is Key and Peele. I would love for Canada to have a successful skit show. The tough part about it is that even great skit shows can have bad skits but the personalities carry it anyway. I am not saying the personalities here can't do the same with time. But it takes a feel out period with any skit show before the audience feels like that want to see the characters doing something ridiculous. Congrats on making top 55 and good luck with getting into the top 15! I appreciate the shout-out to anthropomorphic rocks. Looks like you have a good thing going here! Probably the strongest series of videos on here. Such great production quality it makes me jealous....hope you guys get to move into the next round so that we can see some more human town. You nailed it! This is the best media hype video I've seen in this leg of the competition so much stuff to draw people in and get interested in the story and the story behind the story. STORY! Very strong video again guys, good work. Even though it seems like you're working with content or at least ideas that were in the works before this contest was announced, there's no doubt that you've produced original and entertaining videos every week for Comedy Coup. So while with some teams I'm apprehensive that they're just submitting an already-made show that doesn't fit the contest, I don't get that worry with you since you've proven that you can be original within the actual Week X videos. Good luck with the Top 15! I really liked this week`s video. Great explanation of your project and your team. Keep up the good work. This is project is very original and I am looking forward to seeing more. Not my favourite, but moving up the list. Thank you! I liked your video! It seemed to do the Hype-it well! You seem to have a unique show... and I like that you're all friends. GL! you guys are a talented bunch and do not mind KAT T. comment this is the fifth project she has posted the same exact thing soooo lame. You guys are awesome keep working! Ah, interesting! That's the first thought that comes to mind. Not sure if this show is for me, but definitely appreciate the creativity and the risk taking involved. Good luck! Congratulations on making it to the Top 110 and I good lucking on making it to the Top 15!! I liked it a lot! Cheerios! Appreciate the effort, saw two kinds of humour in the top 55, what I like and what I don’t. I hope I will see less silly and no beeps from the top 15. That was a cute video... It's the only way I can describe it. Good luck!!! Maybe it's me, but the text on the sell sheet is kind of pixellatedy looking, but I still really enjoy everything you guys have put out so far. You have all of my votes, all of them, if real elections ran this way where you can quire more votes by commenting and posting and then just dumped them all on one candidate the world would be a very different place. your sell sheet was done very well. I also really liked your video it was entertaining, informative, and it made me get to know you guys a bit more and it made me hope the best for all of you! I'm noticing some copy and paste messages here that were also left on our Danger os Online Dating Page. Anyways. Interesting way to approach this mission. It is my understanding that fans will decide which teams and shows go on to be included in the top 15 in this contest. good luck. I love how enthusiastic and professional you have been with each of the challenges. You've done a fantastic job! I really love the concept of this show even if I don't fully understand it. Good luck! Keep it up Boys looking great! You guys were right. 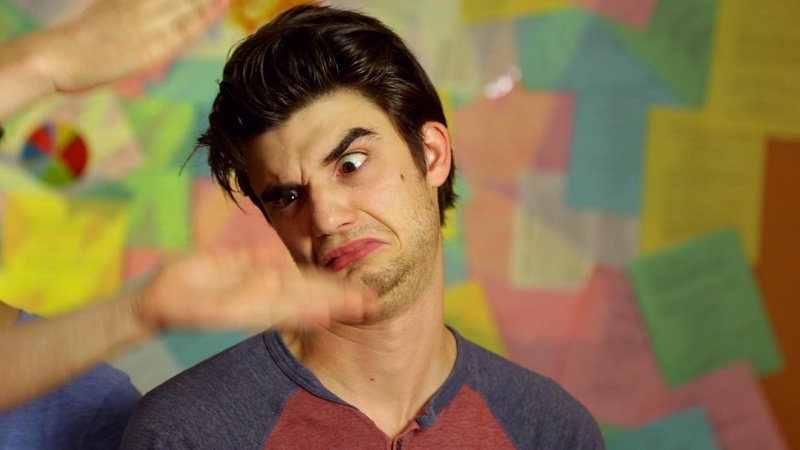 The final three frames of this video were excellent; very funny. Good video. Very original and seems like a funny show. I enjoyed the sincerity of this video. It very explained the concept and purpose very well. Good job. Great video. I this is is a great idea as your videos are well done. Congrats again on top 55 and best of luck with the voting this week for top 15! Lots of heart in this. Simple and to the point and most of all original. I like the fact that you are all friends. That's what makes me like this. Good luck and congrats on top 55. The show looks very promising! I liked the shots of the actual show! Your hype video and sell sheet are both fantastic. The best that I've seen, for real. You seem grounded in your mad skills, and I'd trust you with 500,000. Working together since you were young 'uns, makes my heart go all melty melty. Nice production values for a sketch comedy show. You certainly seem to have had a few past accomplishments. I thought your pitch was attention getting. Good to see long time friends working well together. Good luck to you all for the next round. Fun to see six long-time friends working together, but a bit on the too-self-consciously "hip" side for my taste. Although there's like, a million different sketch comedy shows, on TV. I don't think, that there are any sketch comedies. Where the sketches all tie into each other. At least, none that I've seen. So for that reason, alone. I'd check it out. well done. I have no idea who is going to the top 15. If they want sketch or a sitcom or what but I think you should get some diversity in there if you want to go farther. Daniel you're wearing my shirt! See you on Saturday! I'll be sure to bring THE shirt. Aaaahhhh You guys know I love ya, what else is there to say, except for banana hammock. Definitely my favourite sketch based project in this whole thing. There's something about you guys teaming up with Heir Heads that just makes so much sense to me. I hope to see some footage of the event. I like it, I like it. I thought this was a quick paced and engaging pitch. You certainly seem to have all the puzzle pieces to create an imaginative and unique show. Well done and good luck in reaching the top 15 Human Town!! This was my favorite Human Town project. I like the concept of 6 youngin's with chemistry and commitment making movies together. Good Luck! There's a lot of heart here, and that usually leads to good things! Good luck! Good to hear about some of your past accomplishments. Hopefully this project is a success for you guys. Good luck making the top 15! The Jian bit and the last line were the only jokes that worked for me. With all due respect, I feel there are a lot of groups doing this kind of thing with a lot more money and experience behind them. (Not referring to Comedycoup, but to sketch tv as it stands right now) It looks like you guys are trying to do a fantastical "Mr Show" type sketch show and I am sure your hearts are in the right place, but I'm not drawn to any of you as artists, you just seem like a bunch of fanboys having a good time. how can we trust that will produce something of value? This being a direct Media Pitch Video, we kept the focus low on jokes, and more on info. This is amazing! the colors, the acting, the cinematography all look great! this is my favorite project by far. Love the energy in this HYPE video. I wish i lived in Vancouver for your event on saturday, have fun everyone who goes, and goodluck to you Humantown! It sounds like you have already had a lot of success and I hope it continues. Good work and best of luck for making the top fifteen! Your show looks really impressive. You sure have a lot of credits already. Nice to see the other three guys in this one. I am ready to help vote you into the top position! I hope you win. Some good creativity on the whole media involvement piece here. Good use of computer screens for effect throughout the video. You guys continue to maintain interest. Great HYPE IT video, was simple but well done, it got the point across, so many good videos this week, just about every team upped their game and so did you guys. Waiting to see what u do next and good luck with your HYPE event Sat. Great video. In the end they just like making comedy and films. Perfect, I can't not vote for them because I feel for them. You've got my vote, boys. Good Luck. Great video, very informative to the media about what your show is all about. Also congrats on the article in the Reel West and good luck with this weeks event. I think it's really smart that you are teaming up with another group for the event, the improv show sounds like it's going to be a blast. You guys nailed this week's challenge! Got all the necessary facts in, while keeping in funny. It seems like you all have great chemistry and you're on the same page with this project. I'm also a big fan of your production value. The makeup and visual effects look great! I'm really curious how you get to interweave ogres, cops, and demonic babies though. They can't be all that inter-connected, could they? I'm sincerely rooting for this project, but I do have one major concern. The majority of the humour is of the non-sequitur/absurdest variety, which can be awesome-- in small doses. There was a sketch show on the comedy network waaaaay back called Y.B.Normal (as terrible as it sounds). Joke after joke, sketch after sketch, episode after episode it was all absurd humour. It got really tiresome, really quickly. I hope that in the coming weeks you guys get a chance to show off your comedic talent in a way that doesn't rely on science fiction, demons, monsters, or any of that kind of stuff. Good luck! 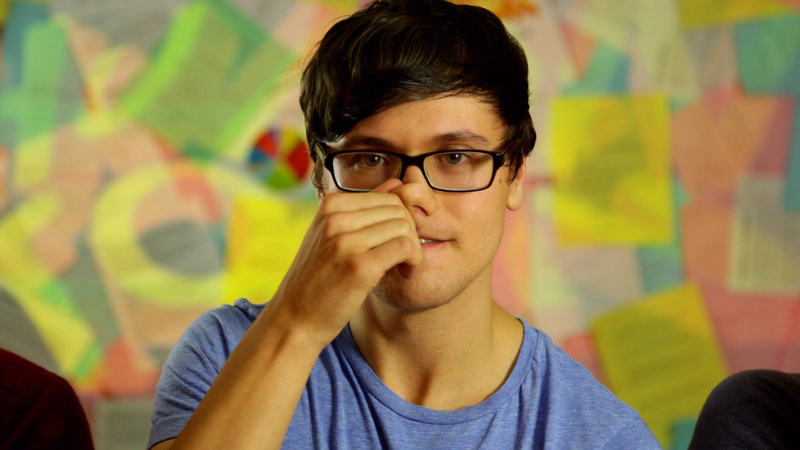 Our video for the next assignment may scratch that itch Max. Its not going to feature any fantasy/monster elements, just another example of comedic style. 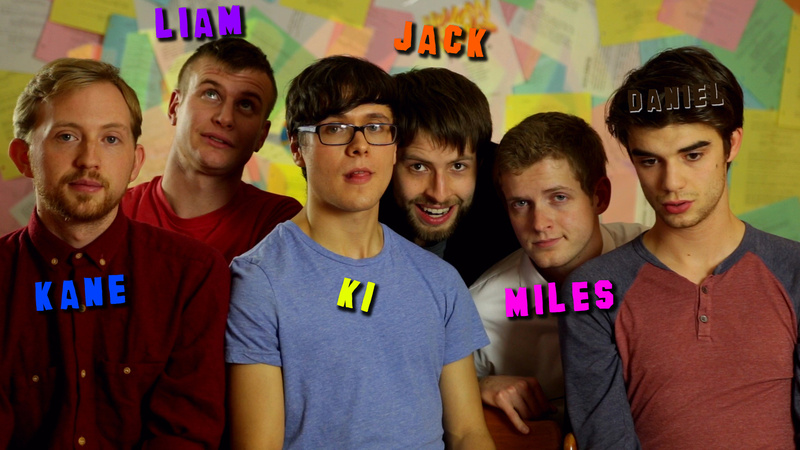 Funny group of guys and the only sketch show pitch I've watched so far. I am a bit concerned that the vague description of what the show is actually doing is a bit of a cover for poor planning. I know general and open sketch projects are tough to describe but saying "we do what we feel like" reeks of dodging the hard work of applying constraints. More specifics, what are some plots which will be carried through sketches, who will carry them, is this just going to be an exercise in sketch to sketch segways? Also check out our week 1 video Andrew, it lays down a few sketch ideas as well as how they would interconnect. Thanks for your feedback! Given the 90 second constraints we have, we can't spend a lot of time outright describing exact plot details. But we definitely have the whole first season written/mapped out. By "We do what we feel like", we mean there's no specific character we're constantly tied down to. Sketches flow in a way that's thematically satisfying... but above all...what's most funny. Good stuff guys, looking forward to seeing you advance! also cool to see the Human/Heads event. keep it up guys and you will make it one day! you guys are always inventive with your videos and great job for all the press you have been receiving. Best of luck to you guys! Funny stuff as always, fellas; you've got all my votes for sure. To be honest, it was those final three frames that did it. Keep up the good work! Nice work on the sell sheet and media presence. It's clear that you are hard workers and dedicated to the success of your troupe. Best of luck! Nice work - all of you. It's obvious you guys have great chemistry when it comes to mixing up a batch full of good laughs and your visuals are excellent. Good luck with moving on and have a blast at your event. well done on this weeks video! This video makes me root for you guys and it looks like you have been working hard for a long time and have a lot of talent. Best of luck. This is the fourth time I've watched this video. Love that you snuck that little bit in after the bumper! Have always loved your concept of a show that evolves like Human Town. Great eye-catching graphics on your sell sheet. Can't wait to see you in the Top 15 and what you do with the remaining missions. It'd be hard to see this group not make it to the top 15. You guys continue to prove that you're different than the rest. Good luck to you all! Great stuff guys! I will definitely be attending your Hype event and be prepared to laugh… a lot. Always an amazing job with your videos. Woah, that's exactly how I talk! Are you in the room with me RIGHT NOW??? Nice work, guys! Always a good time watching your guys' videos. Definitely got me hyped for your project! Keep up the good work! Excited to see what you come up with for next week's challenge! awesome!! we need more Billy in this though.... and Kaboom. Gotta add Kaboom in there somewhere. Who's Kaboom? ask Billy. well done on the video guys. Your story sounds similar to Geoff and the Ninja's creators. Your video showcased your strengths well. second page of the sell sheet is a tad hard to read though. Thanks Carly! Love Geoff! And love the Ninja even more! Nice work guys! Loving all your mission videos. Great looking sell sheet too. Hope your event goes well this weekend. Thanks mucho Paula! Big thanks to our friend Stephen Morgan who did the graphic design and photography for our sheet. clever concept! I like dogs and cats! My name is Daniel! Therefore you all rock!! That is how I talk!